Format: Seven round Swiss over 7 Thursday evenings. Round 1, 9th May: 7:40 pm sign in, round starts at 8:00 pm. All other rounds: 7:45 pm. Entry Fee: $10 members, $25 otherwise. Queen's B/day Weekender at MCC. Discount entry closes 1 Jun. Details here. These are at the start of the June school holidays. Discount entry closes 25 Jun. Details here. 6 Sat afternoons - 4 player teams. Details here. 19 players participated in this holiday tournament. See the final cross table here. 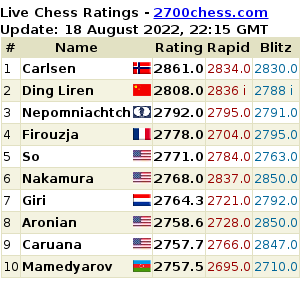 When the mayhem of blitz chess cleared, these were the place-getters. The full tournament results here. Croydon Chess offers an enjoyable, family-friendly environment suitable for chess players of all ages and skill levels. We meet on Thursday nights during school terms. Juniors: 6:30pm to 7:30pm, Youth: 6:30pm to 7:30pm and Seniors: 7:30pm onwards. We have a tiered coaching program for our junior & youth players and coaching nights for our senior players. We run regular tournaments from fun Blitz events to strong ACF rated Open events. - Edge is mostly fine, but some versions of Internet Explorer require the website to be added to 'Tools > Compatibility view'. - Safari and Chrome sometimes have difficulty opening links on our tournament pages. You may need to Right-Click on the link and open in a new tab. Downloadable documents are mostly pdf files and wiil require a pdf reader (such as Adobe Reader) to view. Bayswater, Blackburn, Boronia, Box Hill, Chirnside Park, Croydon, Doncaster, Donvale, Ferntree Gully, Forest Hill, Glen Waverley, Healesville, Heathmont, Heatherdale, Kilsyth, Knox, Lilydale, Mitcham, Monbulk, Montrose, Mooroolbark, Mount Dandenong, Mount Evelyn, Mount Waverley, Narre Warren, Nunawading, Park Orchards, Ringwood, Rowville, Scoresby, Seville, Silvan, Templestowe, Vermont, Wandin, Wantirna, Warburton, Warrandyte, Wheelers Hill, Wonga Park, Woori Yallock, Yarra Glen, Yarra Valley (covering council areas of Knox, Manningham, Maroondah, Whitehorse and Yarra Ranges). We have also listed other Melbourne and Victorian clubs on our external links page.